Protecting your truck from damage can seem like a never ending job, but luckily, Line-X of Austin is here to help! 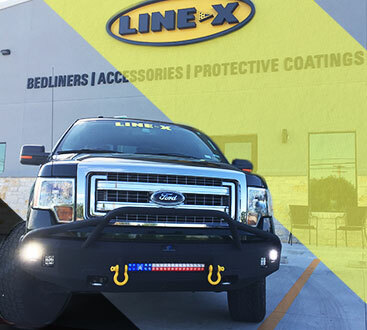 One of the easiest ways to keep your truck in great shape is to have us install a Line-X bedliner! At our in-house service center, we have top-of-the-line equipment and highly trained staff that have the experience needed to get the job done right the first time. Whether you’re looking for only a bedliner or you need nerf bars, new lights, a lift kit, wheels, or a bed cover, we can take care of your needs. Read on to learn why our spray-in bedliners are always a better choice than a drop-in liner, then give us a call for a free estimate today! As an authorized Line-X dealer and installer, we can get your truck in and out much more quickly than you might have thought possible. If you’ve had your eye on any other accessories, browse the rest of our website to learn more about them, or ask us when you call! Our spray-on bedliners fit your truck exactly, which is something that a drop-in liner cannot do. Even if they are made to fit your particular model of truck, any irregularities or previous damage will create an area where the fit isn’t right. If the fit isn’t perfect, the bedliner can scrape up your paint, or allow in moisture which could cause your truck bed to start rusting. Worst of all, if your bed is covered by a bedliner, you won’t know that you have a problem with rust until it is too late. Because a Line-X bedliner adheres directly to your truck bed, and because it is made from special materials, it is much stronger than a drop-in liner. Drop-in liners can break if anything impacts them, and they can crack if it gets too cold out. What is the point of paying good money for a liner that doesn’t really offer any extra protection? Thanks to the special formulation that makes up a Line-X bedliner, it resists denting and cracking in a way that other materials just can’t match. 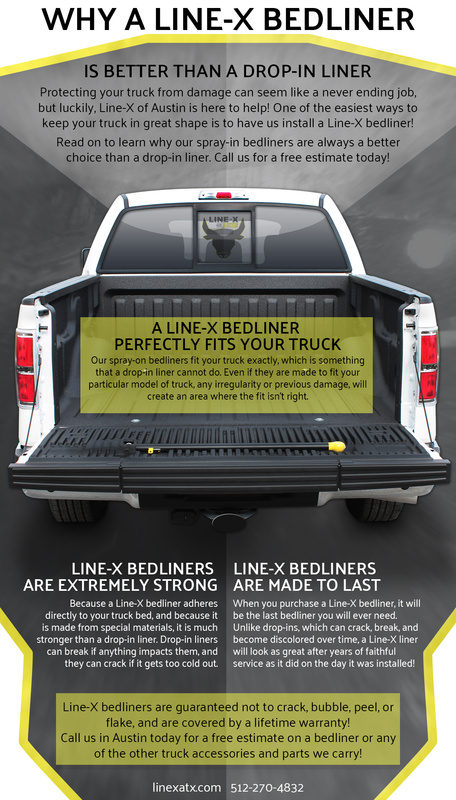 When you buy a Line-X bedliner, it’s the last bedliner you will ever need. Unlike drop-ins, which can crack, break, and become discolored over time, a Line-X liner will look as great after years of faithful service as it did on the day it was installed! In fact, Line-X bedliners are guaranteed not to crack, bubble, peel, or flake, and are covered by a nationwide lifetime warranty! 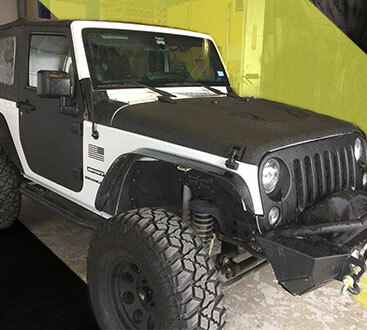 No matter where you had your bedliner installed, if it starts to break down, any authorized Line-X installer will fix it for you! Call us in Austin today for a free estimate on a bedliner or any of the other truck accessories and parts we carry! We’re dedicated to providing you with great prices, unbeatable customer service, and the best installation that money can buy. We are truly Austin’s one-stop truck accessories and parts shop!